This is the dramatic moment a distressed elephant tries to rouse her baby from anaesthetic after the animal was caught in a poacher's snare. Footage from Olare Motorogi Conservancy in south-west Kenya shows a calf being darted by a veterinary team with a tranquiliser after it was injured by a poacher's snare on his hind leg. As the calf loses consciousness, the mother is alarmed so that she too has to be sedated in order to ensure a safe rescue. With the rest of the herd looking on, the vets have to act quickly. The snare can tighten over time, cutting into the flesh and causing horrific injuries. Thankfully, this snare was removed before any damage could be done. Soon the elephant wakes up and is able to rejoin the herd. 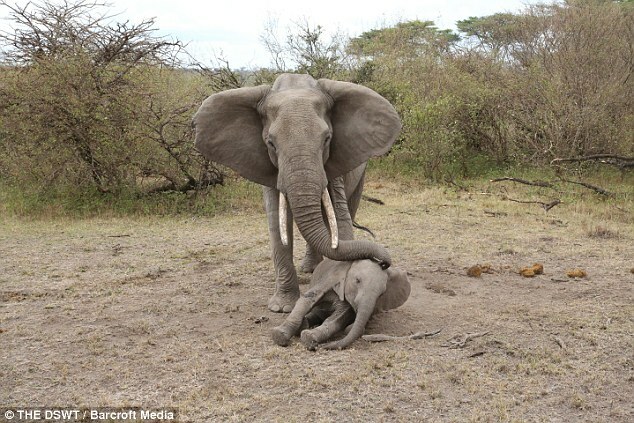 Responses to "Mother elephant desperately tries to revive her unconscious calf"
Glad mom and baby Elephant is doing fine.They should shoot them poachers on sight.